Guard tour app technology has added a real-time situational awareness to mobile security guard services that stakeholders now expect. The vast majority of your clients will no longer settle for paper reporting, or even the equivalent on computer. You need efficient security guard app software to track you officers tours and patrols, in order to compete with other security officer services that have this edge. With GuardMetrics, you can compete with these other guard companies and offer some crucial advantages and solutions to your clients that other guard tour apps cannot. 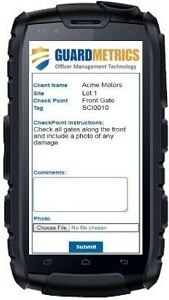 Call us today to discuss why this security guard tour app will win you contracts! Most guard company software is very similar; over-complicated and under-serviced. If you have tried other mobile guard tour apps and officer management systems, then chances are that you agree with at least one of those critiques. This is because many security officer business application developers never had anything to do with the security industry, but decided this would be a nice niche to make money in. Another reason is that, even if the guard tour app was conceived by someone who had a guard business background, they hired a bunch of software developers to build their guard tracking and reporting system. When you couple these shortcomings with the fact that 95% of these companies seem to think Support should only be made available from 9AM to 5PM, Monday through Friday, it’s all adds up to the same thing: An over-complicated and under-serviced security guard tour app. 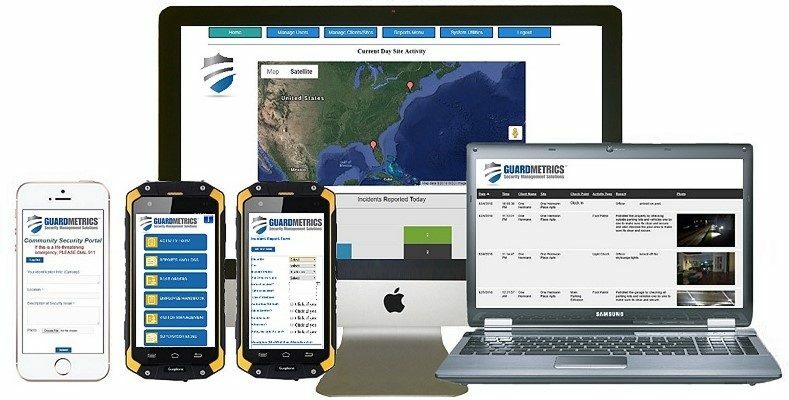 GuardMetrics was developed by security guards and security guard managers that learned programming/coding after-the-fact, in order to simplify the GPS guard tracking and mobile reporting processes. With us you will find a clean, simple, affordable security guard app that will get you and your clients what you need, when you need it. You will also find a team of security industry professionals that obviously have your best interests at heart. Our clients are always surprised when they call late in the evening, or on a weekend or holiday, and have their call answered by a GuardMetrics representative, right here in America. We understand that security is a 24/7 proposition, so we are here for you accordingly. Call GuardMetrics, or click here, to speak with a security guard tour app expert that is here when you need us. Many specialized reports not available elsewhere. Call us for a security guard tour app that will work on iPhone, Android, Google Phone or any smart device; including your officer’s mobile phones. And that is not all that GuardMetrics has to offer. We have endeavored to become a one-stop-shop for all your security business needs. We encourage you to investigate the Security Operations Management Services page of our website and see if any of the services there may help you grow; many, you’ll find, offer you a way to open new revenue streams while simultaneously helping your clients with stronger security! Call GuardMetrics to discuss this excellent security guard tour app software and other ways that we might be of service, including our other security guard app that is scalable into a PSIM system.